Finding the best shampoo for your dog is the first step to a successful dog bath and a fresh smelling pup. When bathing your dog, it’s important to only use shampoo specifically formulated for dogs as opposed to human shampoo because a dog’s skin is not equal to a human’s. Compared to human skin, a dog’s skin has fewer layers making it more sensitive. Their skin also has a higher pH, so human shampoos are typically too harsh for a dog. The best dog shampoos are free from harsh chemicals and added fragrances to maintain healthy skin wash after wash. Of course even with dog-friendly shampoo, you don’t want to bathe your dog too frequently—check out how often you should bathe your dog. Now here’s a look at the best shampoos for your dog. Made with 3% colloidal oatmeal and organic aloe vera, this dog shampoo is formulated to moisturize dry, itchy skin and promote healing. It has a short list of ingredients, each of which is all natural and soap-free. You and your pet will enjoy a light, pleasant scent and a gentle shampoo that doesn’t wash off topical flea applications. Though it’s labeled for puppies, this sulfate-free and paraben-free shampoo can be used to wash dogs of all ages and all coat types. It has a soft, fresh orchid fragrance and is gentle on sensitive and itchy skin. This shampoo lathers well and contains natural odor-neutralizing ingredients for long-lasting freshness. This is a great option for dogs with sensitive skin. 4-Legger Dog Shampoo has earned the USDA certified organic seal, it lathers easily, and is made for dogs of all ages. This natural formula is free of detergents, parabens, sulfates and artificial ingredients. It washes away the dirt and stink without stripping your dog’s skin of its natural oils. 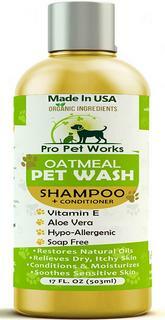 Oatmeal is commonly added to dog shampoos because it is natural, gentle and moisturizing. This oatmeal shampoo is formulated for sensitive skin and is free of sulfates, fragrances, soaps and detergents. While washing your pet, you’ll notice a pleasant, fruity smell and a very sudsy lather. Plus, it’s safe to use on other pets, like cats, rabbits, and ferrets. Wahl’s moisturizing oatmeal shampoo for dogs has a coconut and lime verbena scent. Bath time is made easy with a rich lather and your pup will enjoy hydrated skin and reduced itching. It’s gentle on sensitive skin, and PEG-80 free, making it safe for all skin types. The deShedding shampoo by Furminator is enriched with omega 3 and 6 fatty acids and is free of parabens and dyes. It contains calendula extract and papaya leaf extract for a pleasant fragrance. This shampoo is formulated to release the undercoat during bath time (get your drain snake ready!) to help reduce shedding between baths. This veterinarian-recommended shampoo is beneficial for dogs battling seborrhea, mange, and other parasitic, fungal, and bacterial skin infections. It is gentle and will not wash away topical flea and tick medications. This shampoo is free of parabens, dyes, and soaps, and contains colloidal oatmeal to help hydrate the skin.